Pinnacle Cart was developed by a group of Internet entrepreneurs with over 20 years combined experience in the Internet industry. The Partners bring their expertise in marketing and business development together to provide the online business owner an entry to Internet sales that gives them the chance to capture the online market effectively without becoming experts in the field of Internet web site development, online marketing and efficient web delivery. ChannelSale’s pre-compatible integration with Pinnacle Cart can help you reap the rewards out of this web store solution. Are you an Pinnacle Cart seller in need of promoting your business effectively across multiple shopping sites? From top online Marketplaces like Amazon, eBay, Walmart, Sears, Rakuten, Newegg, Wayfair, Overstock, etc., To Comparison Shopping Engines like Google Shopping, Nextag, PriceGrabber, Shopzilla, To Affiliate Networks Commission Junction, Share A Sale, Link Share - integrate with these big names by putting your trust on ChannelSale. Hire our Pinnacle Cart plugin services at affordable rates. Get 2 comparison shopping engines Sort Price, Bing Shopping setup costing $198 for free with Pinnacle Cart plugin integration with no recurring fee for first month, followed by $149 per month for upto 10k sku’s, add $20 per month for next additional 5k sku’s. 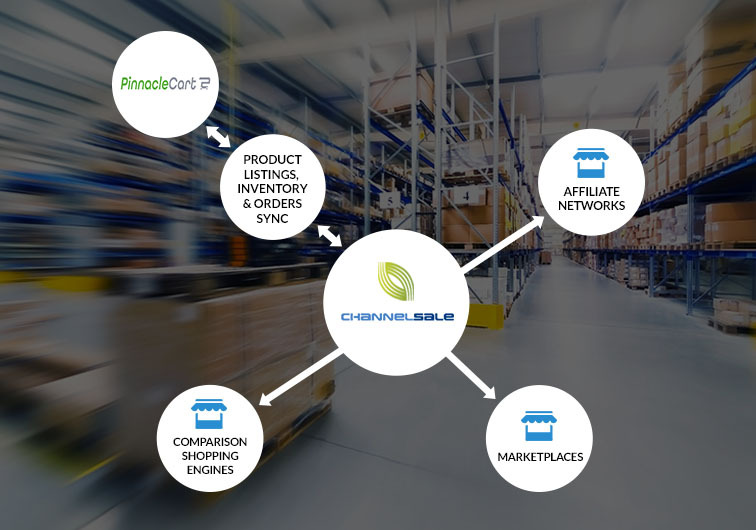 ChannelSale can retrieve your product listings via API-XML from Pinnacle Cart and further synchronize them across all the top online marketplaces, comparison shopping engines and affiliate networks. Real time inventory updates from / to Pinnacle Cart plugin – avoids over-selling and under-selling issues. For example - If a product sells on Amazon, the updated remaining quantity in hand would reflect in your ChannelSale account and further on Pinnacle Cart. Centrally manage all orders. Export Pinnacle Cart orders to third party order fulfillment platforms / dropshipper’s, Fulfilled by Amazon, or to suppliers.